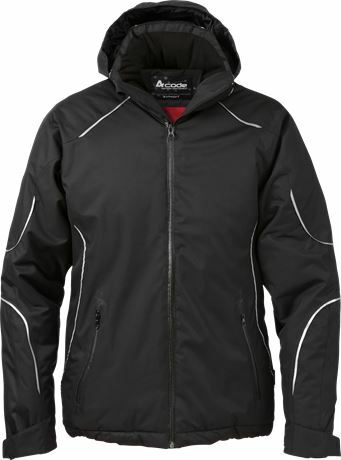 Soft functional winter jacket in sporty design with reflective details and detachable hood. 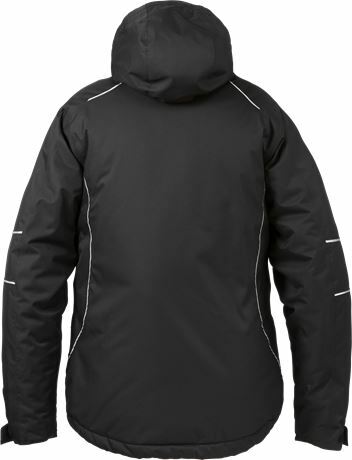 Water and windproof with taped seams. Feminine fit. Weight: Outer fabric 155 g/m², quilted lining body 165 g/m², quilted lining sleeves 115 g/m². Breathable, wind and waterproof / Taped seams / Detachable hood adjustable with drawstring / Fleece lined collar / Waterproof zip to top of collar / Ventilation openings at armpits with zip / 2 fleece-lined front pockets with waterproof zip / Adjustable drawstring at hem / Inside map pocket with zip and earpiece slot / Inside pocket with mesh / Detachable snow stop inside / Zip in lining for easy embroidery and transfer / Sleeve pocket with zip / Adjustable sleeve end / Waterpillar of fabric 10.000 mm.